Dwelling is funded in part by a grant from the National Endowment for the Arts. Additional funding provided by the Boston Foundation for Architecture, the Boston Cultural Council, the Massachusetts Cultural Council, and individual donors. Left: Proposal sketch of Living Room, by Nadya Volicer. Right: Adam Frelin polishes his sculpture, The Mirroring Stone. EXTENDED through November 30th, 2006. Two elegant, whimsical structures combine the Gothic Revival architectural motifs of Victorian monuments with a typical garden device: the birdhouse. Birds are ancient symbols of the soul and transition; the artists also pay tribute to the great variety of birds living at Forest Hills, enlivening the landscape with motion and song. The evocative memorials at Forest Hills enable people from the past to speak to us about their relationships and lives. Halsey Burgund uses 21st century technology to add a new layer of expression to this evocative landscape. Using a cell phone or iPod, visitors listen to a sound collage combining music and processed fragments of conversation collected by the artist during interviews at Forest Hills. A symbolic shelter  a house outlined in gathered sticks  is filled with growing sunflowers. It contains a single chair, offering an inviting place for rest and reflection, a haven nestled into the brilliant color and fragrance of a living garden. The typical Victorian family lot at Forest Hills is laid out to mimic both the architecture of the family home and the structure of family relationships, complete with internal hierarchies and the boundaries that separate one family from all others. Jay Cummings creates a sculptural diagram of an iconic family lot using simplified shapes cast in concrete. These elegant forms will float quietly on the surface of the cemeterys ornamental lake, where water replaces the green lawn that separates monuments on land. An artist and architect combine forces to design an open pavilion expressing their belief that a persons death leaves a gap in the world. Four corner posts and a spiderweb of wire hold up a translucent gabled roof. This airy structure defines an empty room, a place that invites visitors to come to terms with the loss of friends and family. Many of the works on view refer to Victorian architecture. Frelins piece draws its inspiration from a very different Boston landmark  the John Hancock Building. His sculpture  a single tombstone with a smooth mirrored surface  reflects its surroundings much like the modern glass skyscraper, a monumental form that, paradoxically, disappears into its environment. Miniature houses cast in concrete cluster on a rocky outcropping, creating a neighborhood. Each house is modeled on the home of someone buried at Forest Hills. The range of styles, from Queen Anne mansion to modern split level, reflects the economic and social diversity of the generations of Bostonians now residing in the Cemeterys grounds. Two architects have planted the seeds for a lush green outdoor room. Over the course of the exhibition, fast growing vines will cover a simple wire mesh structure, creating walls of foliage. A picture window opposite the entrance frames a view of the landscape beyond; an open roof invites connection with the sky. A stack of colorful birdhouses, some upside down, some at a jaunty angle, rises from the reeds of Lake Hibiscus like a crooked totem pole. Whimsical loops of aluminum piping connect one birdhouse to the next and suggest energy and flight. The houses will dispense seeds and offer shelter. Antique doorknockers are mounted on a series of posts 4 to 7 feet tall, inviting visitors to knock and request entry to an invisible world. Each post has a distinct resonant tone. The simple ritual of knocking builds a bridge between past and present, presence and absence, ourselves and those who have been here before us. 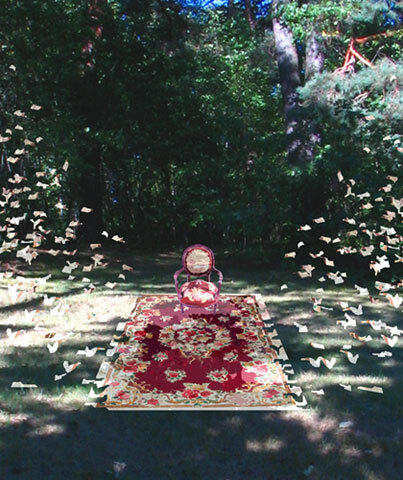 In a shaded space, an intricate Victorian carpet appears to break apart and rise into the air. It is actually a mosaic made of colorful wood recycled from demolished houses. Flying fragments dangle on invisible string from overhanging trees. At the far end of the carpet stands a Victorian armchair., where the viewer can sit, surrounded by trees and the ascending fragments. Nadya Volicer quotes poet Joaquim Cardoza: The souls flew up from the ground: A flock of little birds. Three small dwellings, nestled in hidden spaces, offer glimpses of the character and experience of imagined occupants. 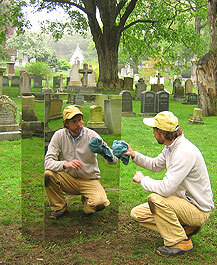 Walsh imagines spaces for poets Anne Sexton and ee cummings, both buried at Forest Hills. Sextons Room is tucked into a space at the end of a stone wall. Treehive is perched in the branches of a small crab-apple tree. The third dwelling hides in a niche formed when a large canopy tree healed. It refers to the stubborn persistence of what has gone, the history of a person or place manifested in the physical traces it leaves behind.